Ready to embark on the most fun (and best smelling) adventure of a lifetime? 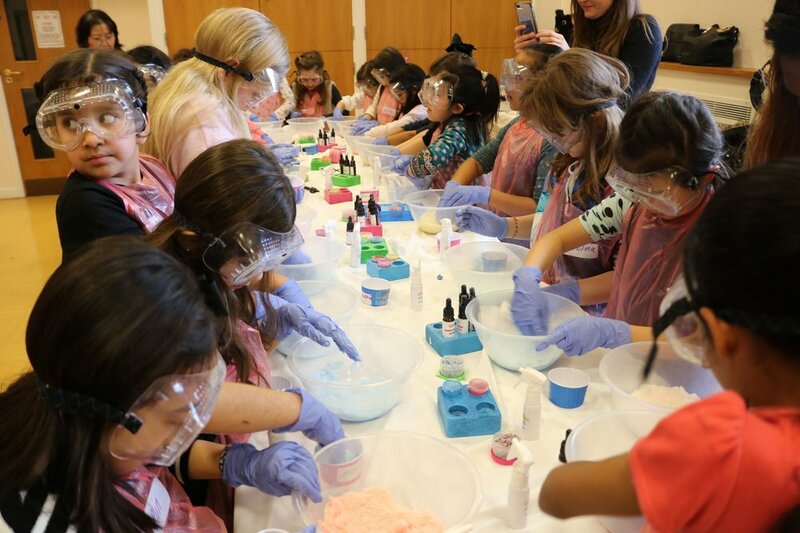 This fun-filled, interactive celebration will see your child and their best friends becoming scent connoisseurs; making their own signature shower smoothie and luxury lip-balm – all using mother nature’s finest natural ingredients. This party is suitable from age 7 upwards. Our team will arrive 30 - 40 minutes prior to the party to ensure everything is set up, ready for all your guests to have a stupendous lip balm & bath bomb making party experience. At the start of the party, each party guest will get their creative juices flowing by touching, feeling, and looking at lip balm and shower smoothie similar to what they’ll be making. Next, Children are introduced to tools and material and are given a demonstration of how to make bath bombs. Then, every guest gets to choose from a large selection of cosmetic fragrance oils and natural mica to scent and colour their signature shower smoothie. They’ll be busy smelling flavour oils to flavour their natural lip balm. Equipped with the know-how children begin making their handmade creation, with our staff overseeing the process and offering help to those that need it. Next guest will be given a demonstration of how to make lip balm, they will learn about the different ingredients used. Now it's their turn.